Crafty Kat: Regrowing Anise bulb...or is it Fennel? 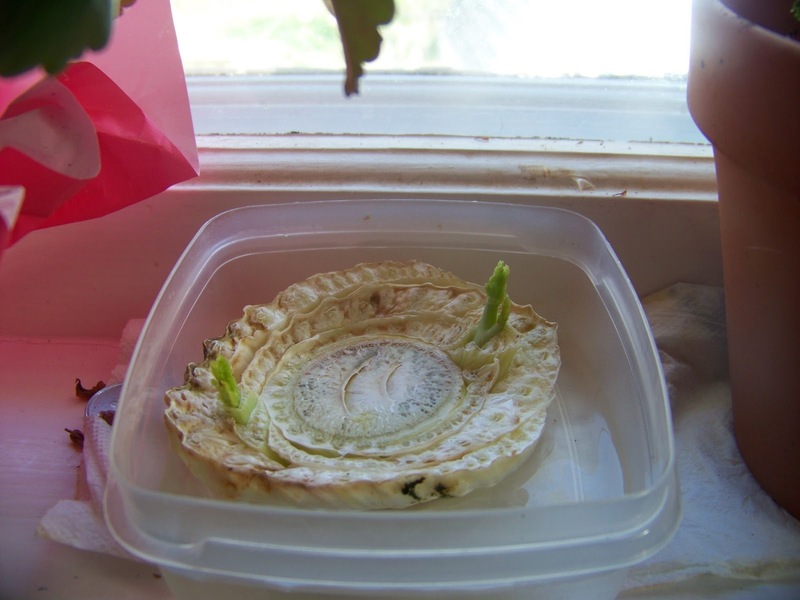 Regrowing Anise bulb...or is it Fennel? I bought a veggie that was labeled Anise at the supermarket. I've always known it as Anise, but I found out it may be a fennel bulb. It tastes like licorice, and I love snacking on it fresh, whatever it is, lol. Last month I started regrowing celery from a cut stalk. I noticed my Anise had a similar stalk, so I cut it and put it in water to see if it would regrow, too. It's hard to see in this photo, but after only 1 day, the Anise started to regrow. You can see the tiny green spot on the otherwise flat white stalk end on the upper right hand side of the anise bulb stalk. Regrowing Anise/fennel from cut stalk end. 1 day's growth. Another shot of 1 day's growth. Regrowing Anise/fennel, after 3 days. Regrown Anise/fennel, after about 5 days. Regrown Anise/fennel, after 6 days. The Anise/fennel is growing a lot faster than the regrown celery did. It's hard to see in these photos, but it's already starting to look like two little Anise plants. It's absolutely amazing to me that it could regrow, and do so this quickly. I'm going to wait a few more days, then put it in a pot with earth. I'll provide updates. If you try this at home, please let me know how yours does. It's a lot of fun, and if these ever get big enough to eat, it can help cut down on bills. A reader asked me for recipes with fresh anise, but I didn't know of any. I always snack on the bulb fresh...it tastes like crunchy green licorice, at a fraction of the calories. I know spirit of Anise is used in cookies, especially Italian cookies like Genetti and Tie plates. I still have some Anise/fennel left from this cut end, so I'll give it a try and let you know how I like it. That's it for now; take care, and have a great day!